SD videos: MP4, AVI, MOV, FLV, MKV, MPG, DivX, XViD, ASF, 3GP, VOB, etc. HD videos: HD AVI, HD MPEG4, HD WMV, HD VOB, HD ASF, H.264/MPEG-4 AVC, MKV, HD WMV, etc. Audios: MP3, WAV, WMA, AAC, M4A, OGG, AC3, etc. Apple Devices: iPhone 6 plus/6/5s/5c/iPhone 5/4s, iPad Air/mini 2/4/mini, Apple TV 2, iPod touch 5g and so forth. Android phones and tablets - Samsung Galaxy, HTC One, LG, Motorola, Sony, and etc. Media Player: MP4 player, Zune, Creative Zen, and so on. Game player: PS3, PSP, Xbox 360, Playstation 3, Nintendo Wii, Xbox One, etc. 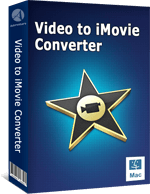 Convert and Import AVCHD to iMovie, QuickTime, YouTube, etc. 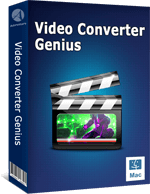 Convert camcorder AVCHD videos to Mac software like iMovie, iDVD, QuickTime, Final Cut Pro, iTunes. 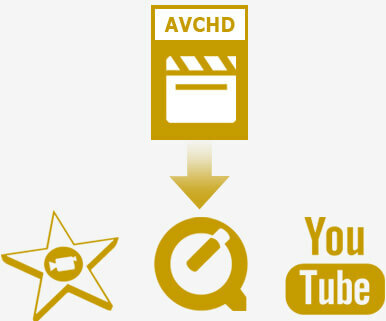 Share the AVCHD videos created by your camcorder online such as Facbook, Twitter, YouTube, Vimeo, and etc. 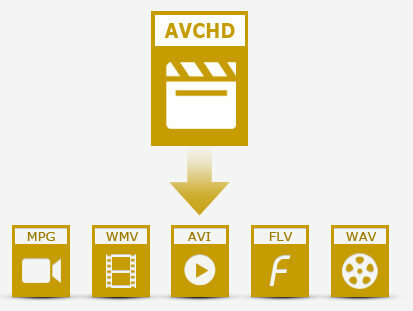 Support all AVCHD videos in MTS, M2TS, MOD, TS, TP, MOD, MKV files. Compatible with all AVCHD videos filmed with Canon, Panasonic, Sony, JVC AVCHD camera/camcorders. Trim the sections of a video file that you don't need. Crop the undesired edge of your video. Add watermark with an image or text on your video. Add subtle to help your video reach a wider audience if you want to explain the clip further or to add another language to it. Take snapshots of your videos and save them in GIF, JPEG, PND or BMP formats. Preview the original video and edited video side by side in the built-in player. It's super easy software that doesn't require any skills. It keeps the quality of your videos with crystal clear image. "I will definitely recommend this to my friends. 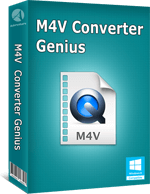 It could be the best video converter I've used. I'm so pleased with the conversion results." "Good job! The batch conversion is great. I converted a 1.8GB video within 5 minutes."